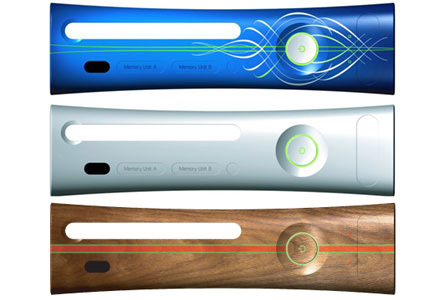 Much has already been written about Microsoft’s new console, the Xbox 360. We have a bevy of game reviews, accessories to buy, Live Arcade titles to play, and even future releases over which we drool. But not much has been written about the audio performance and capabilities of this first-of-the-next-generation contraptions. In this short review, I hope to give you a quick breakdown of the how the system has been working for me. Now that is not to say that every game I’ve played sounds great. Indeed, the Tomb Raider demo I played had some poor choices in sound design. The sound of a rolling boulder was almost cartoon-like in its use of percussion (likely timpani or floor toms) to mimic the sound of rolling downhill. A shameful oversight in an otherwise great sounding game. I plan on checking out the full version of the game to see if the same samples are used, or if perhaps these were placeholders that somehow were never replaced in the demo. As a media hub, I’ve only gone so far as to setup my Xbox for audio streaming. I have a PC in the other room which serves all of my audio files – over 6000 at present. I use it to stream music to my mobile device, and occasionally bring up an album or song at work using a cool application from Orb Networks. I’ve also installed the Media Connect app from Microsoft, which lets the Xbox ‘see’ all of those MP3s as well, turning my Xbox into a living-room jukebox, capable of accessing all of my music, creating custom playlists, and serving up some nice visuals if you’re hosting a party. The playback sounds great, and I haven’t run into any issues with connectivity on the Xbox side, though my PC’s wireless is a bit finicky. Mac users aren’t left out, either. Using a third party app called Connect 360 Mac-heads can stream their MP3 libraries to their 360’s as well. Some of you may recall a story we ran last year regarding the controversial feature of custom-playlists-as-soundtracks to be included in the 360. We followed that story up with interviews with some influential figures in Game Audio. At the time, everyone was a little concerned at how the feature would actually be implemented, but the general consensus was that it wouldn’t negatively impact the need for a well-composed soundtrack for most titles. Fortunately, this has turned out to be true, and I actually really like the way that Microsoft has implemented this feature. Because I have wireless access to my PC’s media library, I can choose to listen to any of my MP3s as the ‘soundtrack’ for the game I’m currently playing. I simply navigate to my Xbox Dashboard, select the album or artist I want to listen to, and press play. The music streams, replacing the in-game soundtrack without affecting the rest of the game audio. While the music clearly can’t ‘adapt’ to gameplay, it is nice to have the alternative to the pre-composed game score. No disrespect meant to the Soule brothers, but when you’re level grinding for hours on end in a game like Elder Scrolls: Oblivion, it is nice to hear some different music once in awhile. I don’t think this feature is what The Fat Man had in mind when he suggested that games should ship with more music content. But the acceptable industry ratio of 40-hours of gamplay to roughly 1-hour of composed music is really a shame. I think most gamers and composers would be pleased with more…So this feature, while not exactly the same as having a few more hours of custom composed music, is a good alternative. And who knows? Perhaps some aspiring composers will even get the idea to compose their own soundtracks to popular games and offer them for download. That way players could just use these songs, rather than those that ship with the game…The possibilities are great and hopefully some budding entrepreneurs will find new ways of using this feature in conjunction with the Live Marketplace. I’m only a few weeks in with my Xbox, but so far I’m very impressed with Microsoft’s choices, and I think they’ve done a lot of great things with this platform. Its capabilities offer great opportunities for gamers and game developers – including us audio geeks – as well. I will be sure to report back as I get more playing time.